What does one pray for when asked to pray for on the inauguration of the President of the United States? Even more, what does one pray for a president whom many already regard as a messiah-figure? The Bible has its own set of inauguration prayers: the coronation psalms. Psalm 72, a coronation psalm for Solomon begins “Give the king your justice, O God, and your righteousness to the king’s son. May he judge your people with righteousness and your afflicted with justice.” I thought of this psalm this morning as the ceremony was going on, but quickly realized it would have been inappropriate to pray for a presidential inauguration. While I do pray that Obama will lead in a way that reflects God’s desire for righteousness and gives justice to the oppressed, the application of any text like Psalm 72 or 110 (also a coronation psalm), to a present-day political leader is idolatrous: Christians who believe that those psalms are ultimately fulfilled in the the reign of Jesus should be wary of using them to describe any other person than Jesus. So again, what should we be praying for President Obama? So, on this historic day, I do pray that God will give Obama wisdom, humility and courage; that he will seek the shalom not just of this nation but of the whole earth. And I pray that regardless of political views, American Christians will continue to uphold him in prayer. As 1 Timothy 2:1-6a says, let “petitions, prayers, intercession and thanksgiving be made for everyone – for kings and all those in authority, that we may live peaceful and quiet lives in all godliness and holiness. This is good and pleases God our Savior who wants all people to be saved and to come to a knowledge of the truth. For there is one God and one mediator between God and human beings, Christ Jesus, himself human, who gave himself as a ransom for all people” (TNIV). I vote within the freedom of my own conscience. I vote understanding that no candidate represents totally the values of the Kingdom of God. I refuse to be a “one-issue voter” or to follow any “party line”. My conscience allows me not to be a one-issue voter because I believe it is possible for a certain candidate to more effectively remedy certain issues than another who claims to have the right view on such issues. I do not believe it is a Christian obligation either to vote or not to vote. I know other Christians who will vote (or not vote) today in ways differently than I do. This does not make any of us “more Christian” than the others. I believe God is sovereign and pray that God’s will would be done regardless of the ballot I cast. And off to the polls I go . . . Lord have mercy. The Jesus for President tour is free. The Church Basement Roadshow will cost $10 at the door. If you’re around for either, it’s definitely worth your time! On the Day of the PA Primary . . .
Today is the Pennsylvania Primary, so it was good timing to stumble upon this last night which pointed me to a great episode of American Public Media’s Speaking of Faith. In it, Krista Tippet interviews three evangelicals about politics: Charles Colson, Greg Boyd, and Shane Claiborne. In the spirit of Bruce Reyes-Chow’s thoughts on transparency, I’ll do a little self-disclosure here. Each of the men in this interview has influenced me at some point in my life. As a freshman in college, Colson’s book How Now Shall We Live? made me afraid to step outside my dorm room, terrified that evolutionists and liberal politicians were lurking ready to attack my fragile faith. Thankfully, I came to my senses and eventually came out of that cave. As I grew in maturity and gained a broader perspective on life, I came to a much more balanced point of view. Greg Boyd spoke at a retreat I attended through our college ministry and I remember being impressed not just by his speaking, but even more by his willingness to move into the inner-city to live out his message. (And I highly recommend his book Myth of a Christian Nation, especially for his thoughts on pacifism and being “pro-life in a Kingdom way”.) And it was Shane Claiborne’s book The Irresistible Revolution that persuaded us to move into living in community in the inner-city. 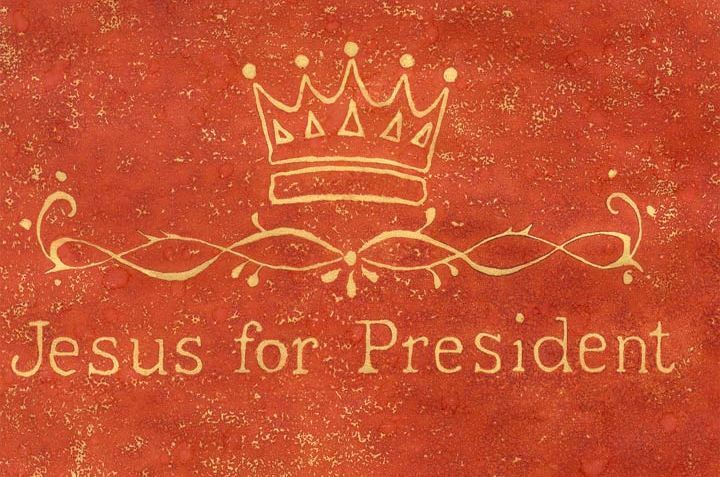 I have yet to read Jesus for President, but I’m looking forward to the tour which will bring Chris Haw and Shane to Pittsburgh on June 26th at the Union Project. As I listen to the interview, and prepare to go vote today, I’m asking myself a few questions. How much can we as Christians participate in a political system that often requires choosing the lesser-of-two-evils? How can we endorse certain political leaders without placing false hope in a “savior on capital hill” (to use Derek Webb’s words)? How do we as the Church encourage faithful people to serve in the public sector, while still taking a “power-under” approach (Greg Boyd’s term) to serving the world rather than a “power-over” approach which brings corruption? I had a few Mexican friends in high school, but for the most part stayed within the boundaries of the social segregation that was assumed in my hometown. After finishing school at the University of Colorado, though, I worked in a grocery store where half of my coworkers were Mexican, and many, if not most, of them were undocumented immigrants. Through the little bit of Spanish I learned in high school and the little bit of English they learned in the workplace, we talked, learned each others’ stories, and came to share profound amounts of respect for each others’ lives. One of my supervisors had worked multiple fast food jobs, supporting a wife and kids on that thin wage for over a decade before finally getting the better job at our grocery store. Another man never learned much more English than “how can I help you” and “thank you very much”, but was the hardest worker in the department and supported his wife and kids on that slim wage as well. Yet another man sought to continue climbing the ladder by applying for a promotion to “coffee-specialist”, and even though he knew the job and the product inside and out, couldn’t get the job because he didn’t speak enough English. Then came the month where the store did a “social security audit” verifying the SSNs of all their employees. Some numbers, of course, came back with problems. To protect the company, many of my friends were let go gracefully, given two months to find another job rather than being fired immediately. The man who was my trainer told me with tears in his eyes, “We all know this happens. It is sad. But we will find other jobs.” He started looking for work in construction, others went to landscaping, and still others back to fast food. Their lives were uprooted, the relationships they’d built destroyed, and their years of hard work wiped away. Seeing their pain and their struggle, their efforts to make a living, to provide for their children, and still have money to send back to family in Mexico, makes an impression. It is easy to talk about “illegal immigrants” the way the newspapers do. But when you’re talking about mis amigos de esa tienda de abarottes, you realize they are real people. Immigrants are not worms. They are not here to destroy our country. They are here because they are real people, seeking real ways to support their families, and trying to give their children a better life. Now add to this basic human right the theological truths that we Christians believe: Abraham was an alien in a foreign land, as were the Israelites in Egypt and later in captivity in Babylon. In the Incarnation, Jesus Christ came as a foreigner to our level of humanity. Since Christ came, Christians have recognized that we are all aliens in a strange land, not at home until we arrive in heaven. We are, in St. Augustine’s terms, the City of God dwelling within the City of Man. The letter of First Peter opens by calling us “strangers in the world”. How can we, strangers in the world, blessed by the immigrations of our spiritual forbearers, deny justice to immigrants in our own nation today? Think on the words of Malachi 3:5 (NIV): “So I will come near to you for judgment. I will be quick to testify against sorcerers, adulterers and perjurers, against those who defraud laborers of their wages, who oppress the widows and the fatherless, and deprive aliens of justice, but do not fear me,” says the LORD Almighty.